Back to Cancer, On a Good Note! A few months back I had the pleasure of being interviewed for the AAMC Blog. 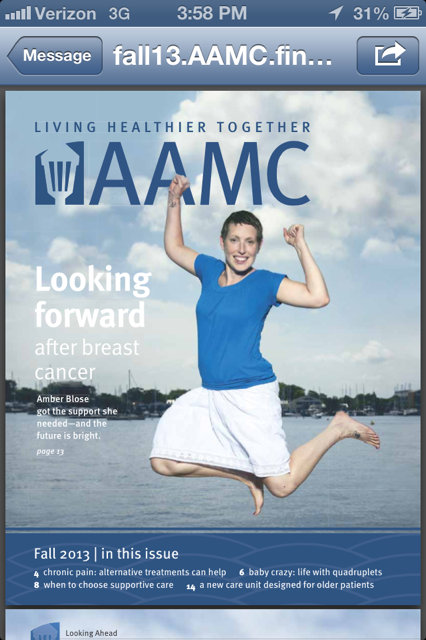 I was then contacted by their media personnel who wanted to conduct a photo shoot as my interview would be featured in the upcoming fall edition of the AAMC Magazine. What an honor! Not to mention the shoot was a lot of fun. At the beginning of September I was informed that the magazine would be coming out at the end of the month. They also sent me a preview pdf copy. Imagine my surprise when I opened up the attachment and found not only the article, but I had been selected for the cover!!!! Holy Cow!! Very exciting news indeed. Since the magazine has come out, I have been stopped numerous times by not only co-workers and friends, but complete strangers. And each time they have told me what an inspiration me and my story are to others. This is by far the most amazing compliment I could ever receive. The fact that somewhere my story is making a difference to someone is the reason why I am an open book and will continue to tell my story to anyone that will listen. Here is the link to the article and I’ve included a copy of the photo and article as well. This entry was posted in Breast Cancer, Diagnosis, Healing, Recovery and tagged AAMC, cancersucks, cancersurvivor, hope, lifeaftercancer by surviveber. Bookmark the permalink. Beautiful as always! They could not have picked a better woman to adorn the cover. Love you!